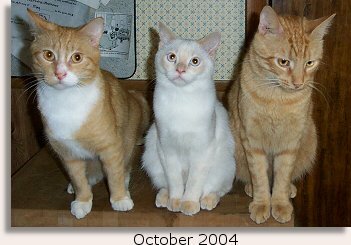 Here are three of our cats. From left to right- Kyle, George, and Lewis. Kyle and Goerge were both rescues of sorts. Children were handing out free kittens at a local auction so George came home with us the first week, and Kyle, the second. Lewis was a gift from Jake’s mother. He is half Himalayan and half Siamese and his coloring is Flame Point. All three of these guys are raw fed and vaccine free.